One lucky reader of The Parenting Patch and Living As We will win one (1) $100 Target gift card compliments of the USA Herald, the Daily Globe, Indyposted, and the Daily Digest. Me? I would probably use it towards some fun spring activities for Emily and I. After hibernating as much as possible this winter, we are definitely looking for ways to enjoy the outdoors as the weather gets warmer! To enter for your chance to win the In the News April Fool's Day $100 Target Gift Card Giveaway, simply use the following Rafflecopter form. Be sure to stop by each day to claim your daily entries. The In the News April Fool's Day $100 Target Gift Card Giveaway is open worldwide. An international winner will receive $100 minus any PayPal charges via PayPal in lieu of the specified prize. 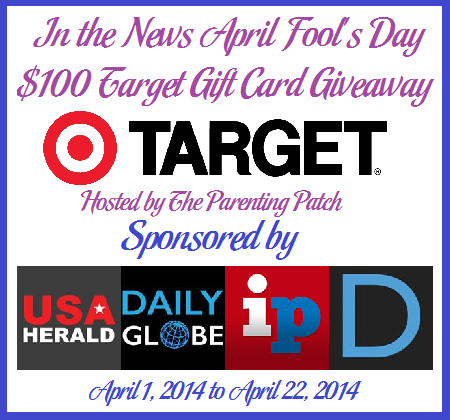 The In the News April Fool's Day $100 Target Gift Card Giveaway ends at midnight CST on April 22, 2014. One winner will be chosen at random via Rafflecopter. The winner will be sent an email and will have forty-eight hours to respond. If no response is received within forty-eight hours, another winner will be chosen. The Parenting Patch and Living As We are not responsible for prize fulfillment. Target is not affiliated with the In the News April Fool's Day $100 Target Gift Card Giveaway.